This week when I was running out the door for a “big” day jammed packed with meetings, blogs to write and things to do, I was in need of a fast, hot and healthy breakfast to get me on the right track. That was when I remembered I had picked up a CedarLane Egg White Omelette. After just popping it in the microwave for just 3 minutes, I had what I was craving… and needed… a tasty breakfast that I would have cooked-up myself if I only had the time. These omelettes are made with egg whites stuffed with uncured turkey bacon, potatoes, bell pepper, cheddar and mozzarella cheeses. Delicious! As well as being gluten-free, this fast and easy breakfast is also low in cholesterol. 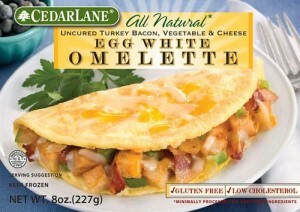 All these reasons are why CedarLane Turkey Bacon,Vegetable & Cheese Egg White Omelettes are this week’s BeFreeForMe’s Friday Favorite! Thanks CedarLane for getting crazy, but important, days going on a great start! This entry was posted on Thursday, October 14th, 2010 at 10:30 pm	and is filed under Friday Favorites. You can follow any responses to this entry through the RSS 2.0 feed. You can leave a response, or trackback from your own site.